Set the scene for uninterrupted solace and relaxation in your home with the lavender scented luxury perfume diffuser from Parks. Using the finest natural lavender extracts, we invite you to enjoy this iconic home fragrance as you’ve never experienced it before. Lavender is one of the world’s most beloved home fragrances, used for centuries for its natural stress-relieving and sleep-aiding properties. Producing a sweet, herbal fragrance, this lilac-coloured flower is often used to reduce insomnia, anxiety and depression, and its natural extract is believed to be a fragrant stress-reliever. Our luxury lavender perfume diffuser uses only the very finest natural ingredients, so you can enjoy the wonderful, soothing scent of lavender throughout your home. 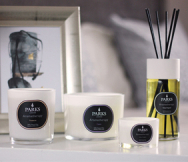 Our luxury diffusers are lovingly crafted to ensure long-lasting fragrance infusion, and feature natural rattan sticks that help to distribute the natural lavender oil evenly and consistently over the lifetime of the diffuser. Never has it been easier to fill your living space with the inviting and soothing scent of lavender. Whether you choose to keep the diffuser in your lounge, bedroom or bathroom, the natural lavender extracts packed into every diffuser bottle will help you create a relaxed and dreamy environment from room to room. This wonderful perfume diffuser features 200ml of all-natural lavender oil extract, delivering up to 12 weeks of strong, long-lasting fragrance. We carefully select ingredients that are slow to evaporate, so you can enjoy pure and authentic fragrance for longer. Delivered in a charming box, our Lavender Diffuser is a wonderful perfumed gift for a friend or loved one.